Want The Most Beautiful Lawn In Your Neighbourhood? We provide complete lawn care services for residential and commercial. Everybody wants a beautiful, healthy, and lush green lawn but it isn't going to happen out of pure luck. A beautiful looking lawn begins with a professional and regular lawn care with a proven routine right from the very start. If your goal is to have one of the best looking lawns in your neighborhood you’re going to need to partner up with a lawn care specialist who knows and understands how to properly care for and maintain your lawn to a high standard. Irreco LLC is a full service lawn care and lawn maintenance company based out of St. Louis, MO. We specialize in providing complete lawn care services for both residential and commercial customers in the St. Louis Metro. 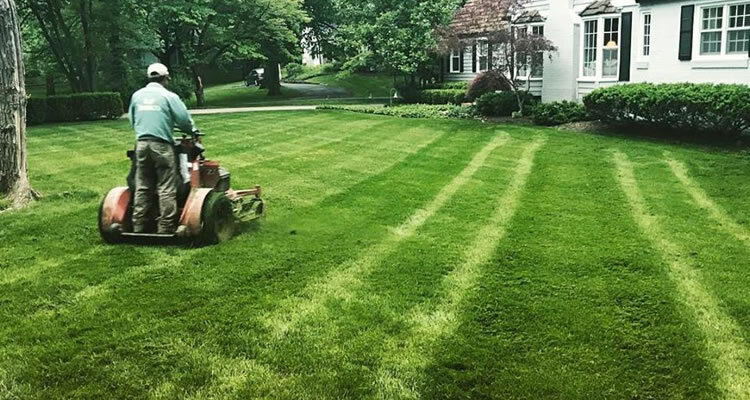 From installing the original lawn to fertilizing, to aerating and mowing the grass regularly the team at Irreco will get your lawn into beautiful shape while you spend your time doing something you enjoy more than mowing your lawn and worrying about it's appearance, leave that to us! *Important Note: It’s not always possible for us to transform an otherwise dead or neglected lawn into something beautiful once again. If your lawn is too far gone or it's more than 50% dead or dying then we’ll need to discuss installing a new lawn either using sod or planting grass seed to get started on the right foot. Why Choose Irreco For Lawn Care & Maintenance? We understand that you have many lawn care companies to choose from in the St. Louis area. We just want you to know that when you choose to work with Irreco you are partnering with a small, locally owned business that has many years of experience keeping St. Louis properties looking their best. Quick release fertilizer for early green with blanket ester herbicide to knock down cool season weeds. Season long time release fertilizer, season long crabgrass preventer and spot treatment of weeds. Specially formulated herbicides to eliminate stubborn weeds without harming your lawn. Heat guard fertilizer with iron to green up your lawn without causing summer burn and spot treatment of weeds. Root stimulator fertilizer to promote new grass growth and crabgrass spot treatments if needed. Winterizer fertilizer helps lawns survive a harsh winter with spot treatment of cool season weeds.